I feel like it’s important to start by once again pointing out that LWA’s problem is not being poorly animated – which it obviously, emphatically isn’t. It’s a comfortably above average TV production, featuring plenty of highlights that would easily fit into the medium’s strongest projects. The latest episode features a couple of great sequences…and that’s basically it, but I want to tackle the animation itself later. Since more importantly, the generally restrained motion is a symptom rather than the illness. There even are a handful of situations – in particular when Takafumi Hori’s animation is at its strongest – where the TV series actually features more impressive movement than similar OVA/movie counterparts. And yet, the impact of those scenes can’t quite compare to the original. The final footage we see is greatly dependent on the key animation that serves as its skeleton, but it’s ultimately the mix of dozens of components; from in-betweens to corrections on a pure animation level, but also massively influenced by lighting, backgrounds, composite, and of course the basic layout the storyboarder conceptualized and was later executed by the animator. The feel of a scene is a vague concept born from all these individually small pieces of work, and in this case LWA has lost its magic. 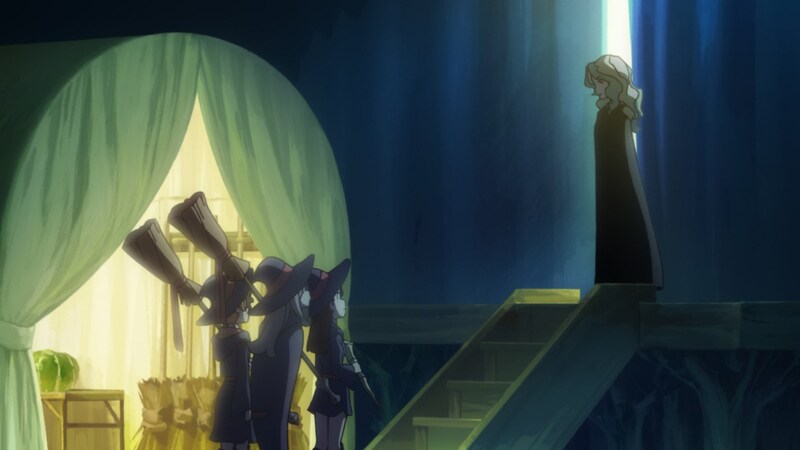 Going from TV anime to theatrical productions is a way more standard progression, which might be why it feels awkward to experience it the other way around, especially with such quality downgrade attached to it. If you manage to dissociate LWA TV from any context, this is a perfectly reasonable production, especially considering the small team carrying it – more on that later. But having experienced something that much stronger, plus the constant readjustment of expectations as the polish understandably trends further down, bother me considerably. If that makes me greedy, then mind you that it’s because this series started off as one of my favorite works of animation of all time. While not being able to leave as much of a strong impression anymore is a problem for an episode meant to depict the school’s (admittedly decaying) magic festival, I did quite like it. This mostly comes down to cheering for Akko and company being such a natural, almost instinctive feeling – I don’t care if it’s not original, I find the underdog dynamic very effective. It also helps that Ryoji Masuyama didn’t storyboard one but two episodes of this final arc, and this final one allowed him to pull off even better work; some rather obvious meaningful framing, but mostly just scenes constructed in a way that is interesting to look at. 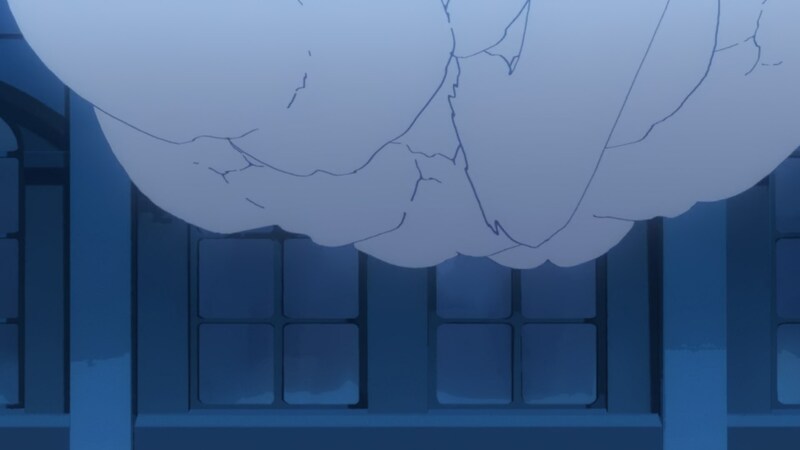 I’m particularly fond of details like this, with Akko’s vision clouding after she starts crying. The show might not feel as grand as it’s meant to be, but you don’t need immensely memorable scenes to offer a pleasant experience. I don’t see meaty narratives as inherently superior, but perhaps the second half which has promised to be much more focused on a continuous story will fit the show’s limited execution better. I said I wanted to leave the animation talk for last, since there are a handful of things I wanted to address. The positive aspects are obvious: Takafumi Hori stole the spotlight once again, further proving that the title of main animator is not for naught. 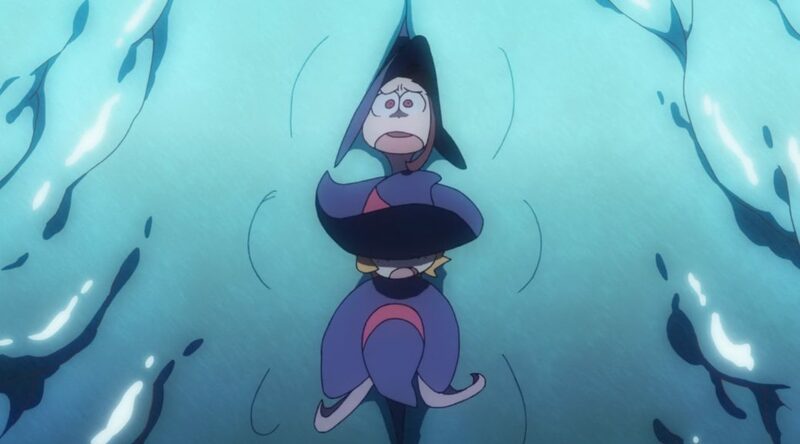 His enchanting effects are such an integral part to the magic spells of Little Witch Academia that I couldn’t imagine them any other way at this point. 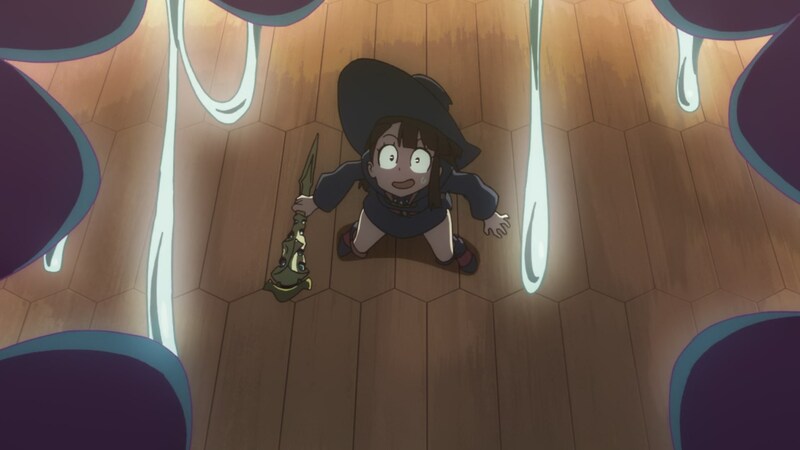 Whether it’s intentional or not, I like how making him animate Diana’s spell also tells you that at the moment she’s actually the one who’s closest to replicating Shiny Chariot’s magic, even if she lacks Akko’s heart. Besides his work I would also highlight the finisher – gallant Akko by Masaru Sakamoto once again? 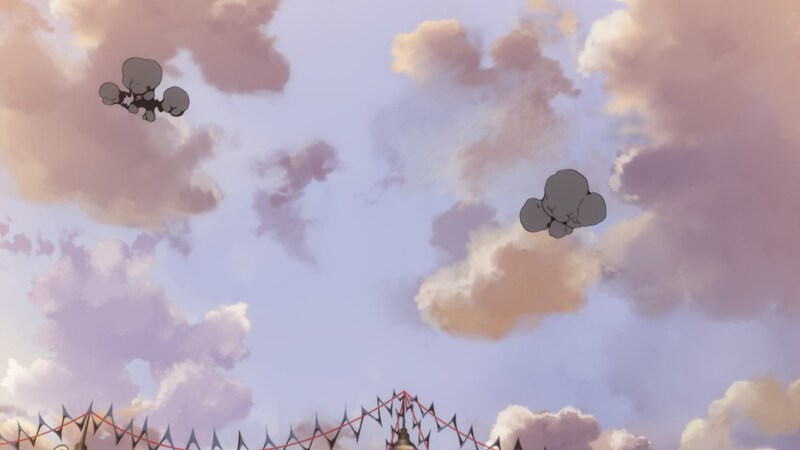 – and these lively pieces of morphing animation, which feel like an idea Yoshinari himself could have. 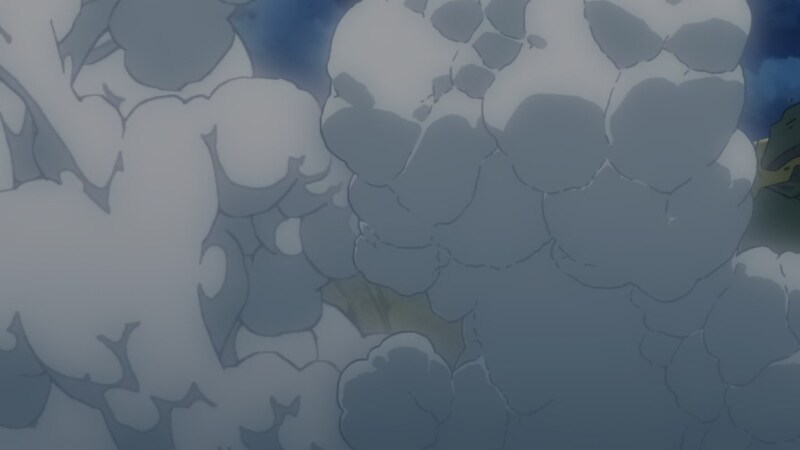 It was also pleasant to see Shuhei Handa’s return as animation director, since that was accompanied by the polish the show tends to lack, as well as the amusing deformations that were so common during the beginning of the series. It’s not exactly consistent in that regard, though; the sequence before the OP and everything after the commercial break are notoriously stronger, which makes me feel those are the parts he corrected. Rather than its uneven nature though, the main issue I had with the episode on an animation level was similar to the feeling I got from the episode as a whole: it’s just alright. If anyone expected something similar to KLK’s midseason climax, let alone Gurren Lagann #15, I’m afraid to say they won’t find it here. And this is something I would never blame the show’s staff for, because they’re doing an excellent job considering the circumstances. Let’s get things straight then, what’s the problem? The show doesn’t seem to suffer the usual TV anime production woes. The animation process isn’t particularly behind, since we know for a fact they were already working on episode 17 last month. Perhaps a bit tight considering Netflix’s early deadlines, but quite decent in the grand scheme of things. So rather than time, lack of resources appear to be what’s asphyxiating this project. As someone who has been transcribing the staff weekly, it’s hard not to notice that the same small crew is working on the series over and over. Not that recurring staff is an issue at all, but if they’ve got deadlines and hardly any external help arrives then they’re going to have to compromise. Despite the strong start, LWA’s transition to TV format has hurt it harder than I expected, and that seems to be due to frustratingly avoidable reasons – from my perhaps selfish viewer POV at least, I imagine that the studio prioritizing other productions that aren’t even announced yet made sense to them. Yoshinari is such an important figure in the industry I really expected an episode like this to attract all sorts of talent, but in the end it ended up being carried by the same small group of artists. The result is functional but not memorable work, and things like the unfitting repurposed FX being ridiculously omnipresent even during action highlights. Can you blame the people creating the series? Absolutely not. But it is a shame. So if they were constrained in staff what would’ve been the best solution to tackle the lack of polish? Giving more time to the correction process? While this is an animation blog, I do think the score and excellent voice acting (particularly Megumi Han) are helping the show still be fun and charming. Is there precedent for that? Netflix extends a deadline and it affects other shows? I am curious. Any chance the BDs will feature more extensive corrections than other Trigger series (Well Kill La Kill did change plenty of things)? The lightning and backgrounds seem like lost causes unfortunately (unless they take over or kidnap Studio Pablo and/or Ufotable). I do think this has been an unfortunate pattern with Trigger though and one I hope is fixed. Wouldn’t the Patreon help them be independent from in-house animators and staff having to freelance or work on other projects outside the company to have a livable wage? Isn’t the higher wages for their staff that allows Kyoto Animation to have the type of quality output they have? I do think it’s a very sensible solution to their production problems of course more money = better anime, but more money can help sort out the problems the company has. Correction I wanted to type ,more money = better anime is not how the industry works* I accidentally implied the opposite. 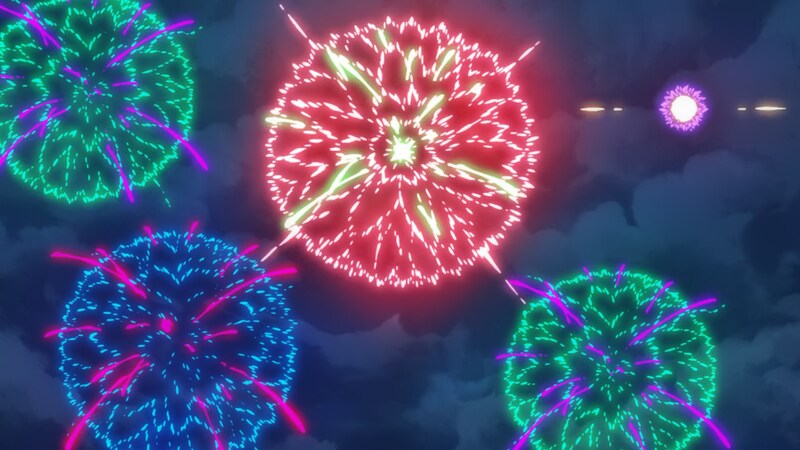 It’s pretty great to lack an eye for animation detail because I get to watch this show and find it all looking great and just enjoying the pretty pictures. I suppose your opinion on the show might have soured more since the mid season as you have stopped episodically blogging the show, but to me it’s been great, mostly for narrative reasons as you’ve predicted. I swear I’ll write about it before Netflix releases *the first half*.